This Medicare Levy Calculator aims to help you work out your Medicare Levy, Medicare Levy Surcharge based on individual and / or family income. According to ATO website, Medicare is the scheme that gives Australian residents access to health care. To help fund the scheme, resident taxpayers are subject to a Medicare Levy. Normally, your Medicare Levy is calculated at the rate of 1.5% of your taxable income. A variation to this calculation may occur in certain circumstances. Generally, tax offsets do not reduce your Medicare Levy. However, if you have excess refundable tax offsets, we use them to reduce your tax, including your Medicare Levy. This free Medicare Levy Calculator is built on the 2015-2016 Medicare Levy threshold so it gives you the 2016 Medicare Levy. You can find the Medicare Levy threshold on ATO website. Here is a screen shot that will give you a better idea that what you need to do and how this free calculator might help you to save money. Please note: Individuals and families on incomes above the Medicare Levy Surcharge thresholds who do not have private patient hospital cover may have to pay the Medicare Levy surcharge. The Medicare Levy Surcharge is in addition to the Medicare Levy. It is calculated at the rate of 1% of your taxable income (including your total reportable fringe benefits). This free Medicare Levy calculator also helps you to work out your Medicare Levy Surcharge. If you want to choose between purchasing a private patient hospital cover and paying the Medicare Levy Surcharge, you can use the FREE Medicare Levy Surcharge vs Private Hospital Insurance Calculator - it will show you which option can save you money. 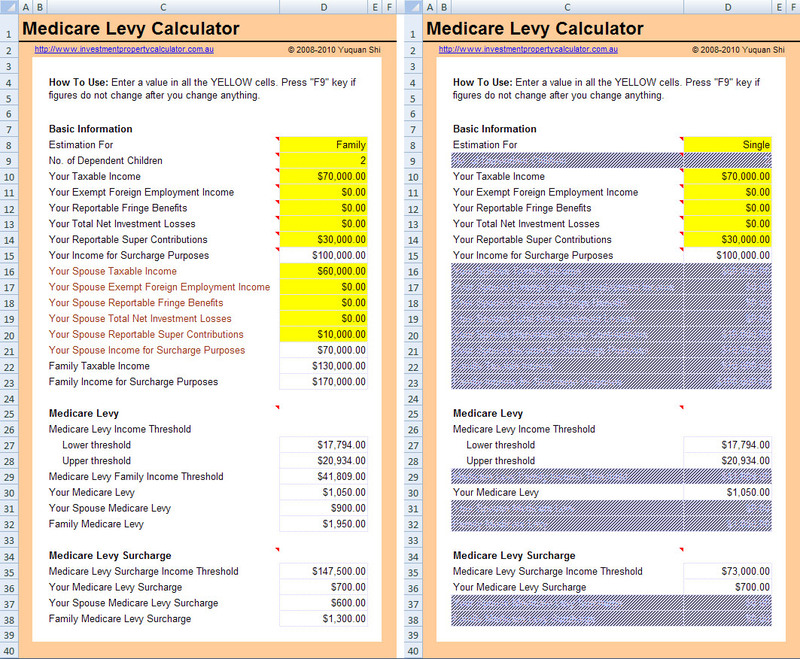 Download FREE Medicare Levy Calculator Now!